As cordless tool motors get stronger and more efficient and the battery packs that power them get bigger, a wider variety of heavy duty power tools are able to go cordless. When lithium-ion (Li) batteries hit the power tool market over a decade ago, some companies chose to focus on large tools with 24- to 36-volt batteries to challenge corded models, but they weren’t quite there. Now it’s a different story. 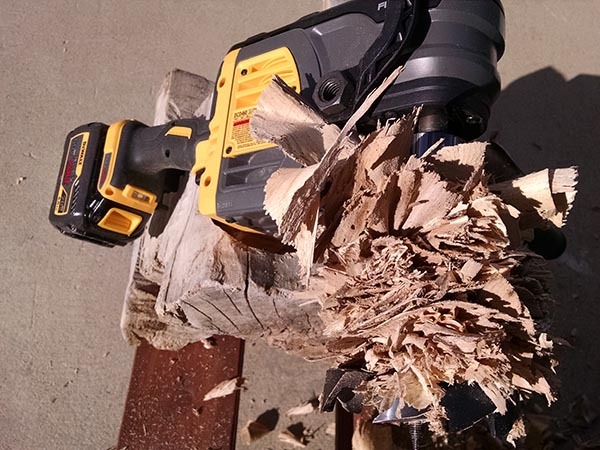 Many cordless versions can handily replace corded circ and recip saws, medium size rotary hammers and chain saws, and even miter saws of all sizes. The two heavy duty right-angle drills I tested are right at home in that “can-do” category as well. 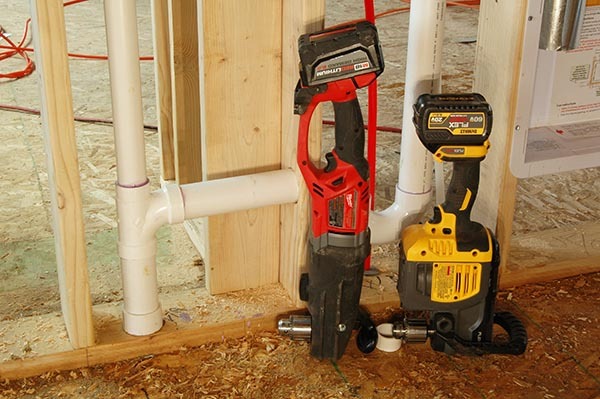 Not be confused with one-handed right-angle drills designed for easy access into cabinets and wall cavities, the tools tested here are the big ones used by plumbers and electricians for roughing-in work. These drills have the highest torque output available among hand-held drills. The right-angle design lets them fit into tightly spaced stud and joist bays while still allowing room for a drill bit, and their elongated bodies and long side handles allow the user to brace against the powerful reaction force of the tool under load. Both of the tools in the test can handle the largest diameter self-feed bits available (4 5/8 inches), and hole saws up to 6 1/4 inches, which is no easy feat. I tested the kit form of each tool using the batteries provided. The DeWalt DCD460T2 kit comes with two 60-volt max Flexvolt packs rated at 2.0 amp-hours (Ah) at 60 volts, and the Milwaukee 2709-22HD kit comes with two High Demand packs rated at 9.0 Ah at 18 volts. Both drills are also available as bare tools so you can use them with battery packs you already have, but power-hungry tools like these benefit from using big batteries. Compact 1.5 Ah and 2.0 Ah packs fit in the Milwaukee, but I wouldn’t rely on them for heavy work. 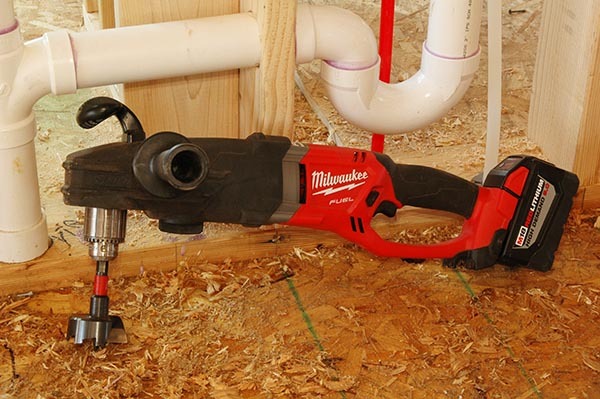 Milwaukee also offers the similar Hole Hawg cordless right-angle drill geared towards residential electricians which is a size smaller and lighter than the Super Hawg. These drills are pretty straightforward in design and use but they do have a few improvements over older corded models such as the addition of motor brakes, LED headlights, and of course, the profound convenience and portability benefits of being cordless. One electrician who used these drills overhead with long auger bits commented on how much time he would save just by not having to constantly retrace his path through a forest of interior studs to untangle his extension cord. Both brands rely on brushless motors to power their tools, which is a key element in this latest generation of cordless tools with greater power. These cordless right-angle drills are fairly similar to each brand’s corded model but the DeWalt lacks the enclosed hand guard of their corded tool and the Milwaukee lacks the rotating trigger handle and has a lower rpm range than their corded Super Hawg. Top and side handles are an important part of controlling these torquey tools. The top handle on the DeWalt can be turned forward or back to change the grip stance along with the tool’s center of gravity, but I prefer it forward with my hand positioned directly over the chuck. The low profile handle on the front of the Milwaukee is positioned well, right over the chuck, and makes the tool a few inches shorter than the DeWalt for better clearance in tight spaces. In a pinch, either front handle could be removed to gain more clearance if needed. The side handles of both drills can be threaded into either the right or left side of the tools and both worked fine, but when bracing against my body, I preferred the soft rubber grip of the DeWalt over the hard plastic of the Milwaukee. Neither side handle socket is threaded for 1/2–inch FIP like some older drills are, so you can’t make a longer side handle out of a piece of galvanized or black pipe. 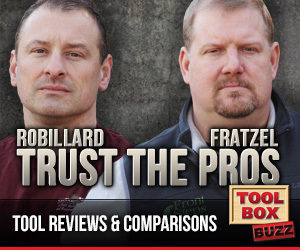 But new safety features make using these new drills less of a wrestling match than with many older corded tools. Everyone who uses powerful right-angle drills with some regularity has a story (or at least knows a story) of wood boring gone wrong when the bit bound up and the drill kept spinning. Guys getting yanked off ladders, arms wrapped tight by a power cord tourniquet, bruises, contusions, etc. And even the back of a hand getting skewered by a pincushion of hardwood flooring nails protruding through the subfloor (my personal story). Holding your own against a high-torque brute can be made easier by attaching a long side handle, but there’s not always something nearby to brace against so a lot of times it’s just you versus the drill. Thankfully, a few modern features are integrated into these tools to improve safety and control. A motor brake to stop the rotation of the drill as soon as you release the trigger seems like a real no-brainer, but is not a feature found in corded models. Being able to stop the bit instantly at the moment of breakthrough or whenever you encounter a jam is a nice benefit of these cordless right-angle drills. Both the Milwaukee and DeWalt have mechanical clutches that work in the low gear setting—another key feature absent in most corded models. When too much resistance is encountered, gears in the driveline will slip to protect the tool and user. I spent a lot of time slipping the clutches in both drills during my heaviest wood boring work and whenever bits got stuck. The DeWalt had a unique trait of disconnecting the driveline from the motor after a short while of grinding the safety clutch, letting the motor run free without spinning the chuck. Releasing the trigger connects the driveline again. It seems like a protective feature to avoid burning out the clutch or overheating the motor, but it’s not mentioned in the manual. The DeWalt also has an inertia-triggered “E-Clutch” that drops the drill’s output power to practically nothing when its internal gyro sensor detects a significant, sudden jerk of the trigger end of the tool. This feature works in both gears, while in forward or reverse. When engaged, a warning lamp on the back of the motor housing lights up, and the tool may or may not continue to rotate, depending on the resistance. When you let off and pull the trigger again, the tool is back to full force. It takes a pretty wide swing of the rear handle to activate the electronic clutch, and it only works when the tool is under load, so it never impaired normal use. I only triggered it once while repositioning the tool so the nuisance factor is pretty low compared to the early version of the electronic clutch on DeWalt’s corded stud and joist drill. By contrast, the Milwaukee drill didn’t do any tricks, it just worked away in a predictable fashion. 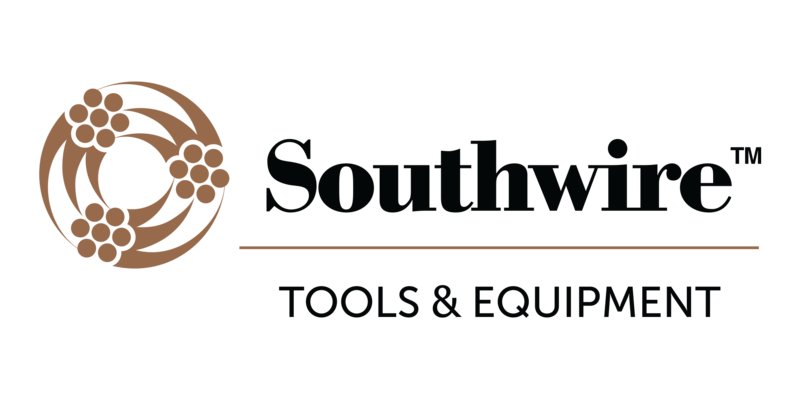 Both drills are rated to handle the largest self-feed bits and hole saws available for boring wood, and of course they’re the right choice for the longest auger bits too. To test raw power, I started out with a new 4 5/8-inch diameter self-feed bit and went to work on some fairly fresh 2x6s in low gear. Both the Milwaukee and DeWalt drills bored through one thickness of the lumber in just over 12 1/2 seconds. Since self-feed bits have a feed screw that regulates the feed rate, they are ideal for comparative testing of application speeds. With a uniform feed rate, the speed a tool can complete a task in equates to the output power of the tool (for that specific load, anyway). So it’s apparent that both drills settled into the same working speed under this heavy load despite the fact that the tools don’t share the same maximum no-load speed rating. I also bored holes through 6-inch thick pine timbers but could not time the results because I had to pause to clear the shavings jammed above the bit after every few inches of progress. To gauge the power/application speeds with a lighter load, both drills clocked in at a little over 8 seconds with a 2 9/16-inch self-feed bit in low gear. Shifting into high gear showed the benefit of DeWalt’s faster speed in moderate loads with times of 3 seconds to the Milwaukee’s 4.6. As a percentage, this seems like a significant time difference, but over a day’s work, it might translate into a minute or so. So I consider the application speed of both drills pretty evenly matched overall. I tested the runtime of both drills with the battery packs included in the kit versions. Since the voltage of each drill is different, the amp hours of the battery packs don’t indicate their energy capacity as well as the Watt hours (Wh) which is simply the voltage multiplied by the amp hours. The product of the Milwaukee numbers is 162 Wh (18×9), while DeWalt cites the product of their “maximum initial battery voltage” of 120 Wh (60×2) instead of the 108 Wh (54×2) calculated using the nominal 54-volt value of the cells making up the battery pack. But this is why we perform tests instead of relying on calculations. 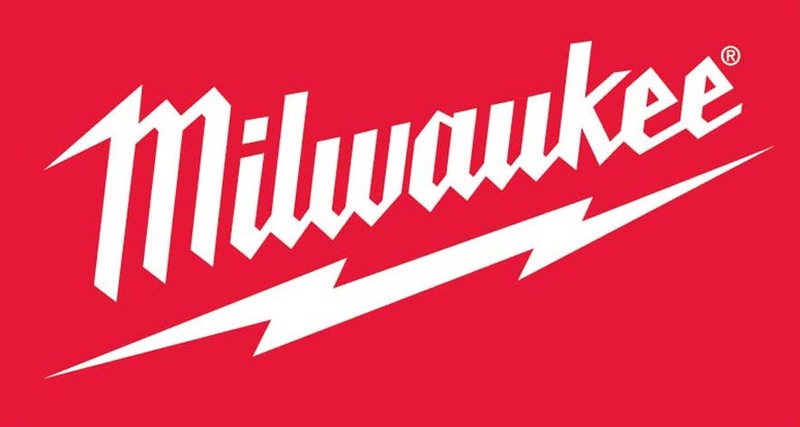 Though the DeWalt’s Wh rating is 74 percent of the Milwaukee’s, the recorded runtime was 89 percent of the Milwaukee’s. 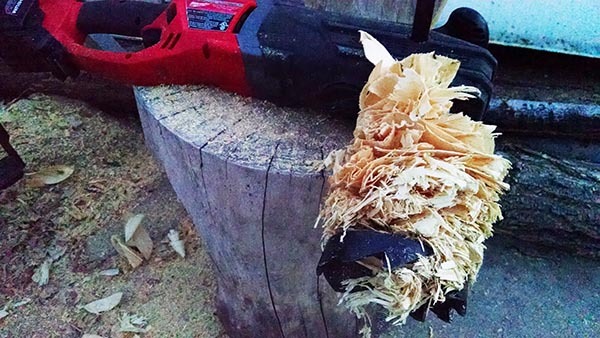 To test for runtime, I converted old, dry Douglas fir 2x4s into barrels of shavings and kindling while boring hundreds of holes with new 2 9/16-inch self-feed bits with the drills in high gear. I bored five holes in succession followed by a quick rest while I used the other tool. After the sawdust had cleared, I ended up with 103 holes from the Milwaukee, and 92 from the DeWalt. Both tools provided an acceptable amount of work out of one charge of a battery by any measure, and logic has it that you could get even more work out of the DeWalt by using their larger 3.0 Ah battery pack. Due to the arm-twisting, body-bruising power of these drills, you should take a few extra precautions when using them. You always need to brace against the direction of rotation to keep control of the drill in case the bit binds up and the drill keeps going. Whether propping the side handle against an adjacent structure, or just leaning into it with some part of your body, you need to be able to adequately fight the reaction force. Another important consideration is to fully disable the tool when installing or fussing with bits. Switching the trigger direction button to the middle “locked” position is a good idea, but for sure safety it’s best to take out the battery to make sure the tool couldn’t operate unintentionally. 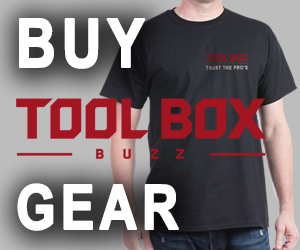 You wouldn’t want to tangle with the drill’s monster torque with your fingers wrapped around the chuck key, or while clearing wood fibers from the sharp flutes of a self-feed bit or prying out a hole saw plug. Better safe than sorry when putting your fingers near the business end of a tool with this much power. A less hazardous reminder is to tighten the chuck with the key in all three holes. The high forces involved can allow a big bit to work loose. Besides the hassle of getting stuck in a half-bored hole, a bit could fall out if not properly tightened. Possibly landing on your foot, or an air hose, or at the very least, dulling the feed point of the bit if it hits the ground. 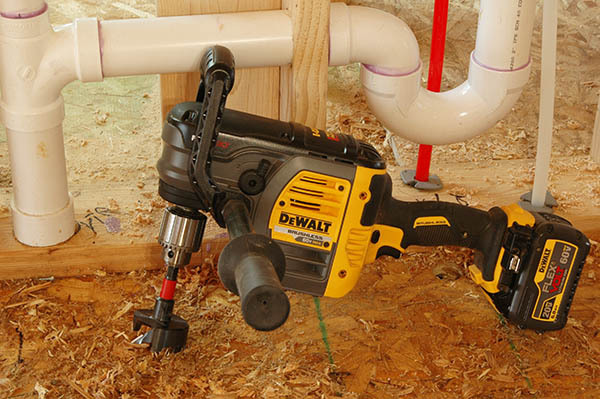 I spent many hours and days using these right-angle drills from DeWalt and Milwaukee on projects ranging from the most relevant–2 9/16-inch holes in framing lumber, to the most demanding–3 5/8-inch holes bored lengthwise through the center of hardwood logs. And in the end, I had to concede to a tie. Despite a slightly faster application speed here or a slightly longer runtime there, essentially, both tools are equally capable. If you have already invested in Milwaukee’s 18-volt platform or in the DeWalt 60-volt max Flexvolt line, it makes sense to stick with the system you’re in. And if you have DeWalt 20-volt max tools, you can always use the big Flexvolt battery pack in them too. Michael Springer is a longtime tool tester and construction industry writer based out of Boulder County, Colo.
Oh man you got to update this review when you get your hands on the new Makita x2 !